Non-motorized water craft including canoes, kayaks and rowboats are permitted on the marsh between July 31 and Sept. 1, after a canoe access permit and registration has been completed. A canoe launch is at the main gate. No canoe permit is required after September 1st. There are three canoe launches, however two are not accessible when the road is closed, but they may be used for a rest or lunch stop. The north edge of the lake has restricted access to protect a wildlife sanctuary and heronry and is marked with orange markers. For more information on canoeing in the Grand River watershed, please click here. After Sept. 5, interior roads open to motor vehicles and motor boats are permitted, but caution is advised. Luther Lake is shallow, weedy and full of stumps. Winds can create dangerous conditions. Keep all safety equipment current. Maximum allowable HP is 25. 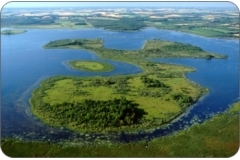 There is 1,400 hectares (3,500 acres) of lake to explore with views of a variety of waterfowl. There are two marked trails in Luther Marsh Management Area: The East Launch Trail begins at the entrance where the parking lot is located. Follow the trail south for an easy six km ride or hike along the interior road. The North Launch Trail heads west from the main parking lot. Also called the bootlegger bike trail, it runs 11 km from the dam. A cyclist can continue four km further to the south end of the road and complete a 32 km round trip by using the township roads to return to the dam. Please stay on the marked trails. A primitive picnic area is at the main entrance. All garbage must be carried out of the park or put in containers at the main entrance. All hunting activities require a GRCA permit and must follow the provincial and federal hunting regulations for WMU #80. No gun hunting is permitted on Tuesday, Thursday and Sunday, except during controlled deer hunts or when an open day falls on a Tuesday or Thursday. Deer, geese, ruffed grouse, woodcock, and rabbit/hare can be hunted during the open limited season. More information on hunting is available in the hunting section or from the Luther Marsh Wildlife Management Area User Guide, which can be downloaded closer to the top of this page. For more information, contact park staff. For the most part, Luther is a placw where nature comes first and this is especially true for birds. As many as 242 bird species have been recorded here. Migrating flocks of waterfowl and shorebirds stop at Luther Marsh to rest and feed during the spring and fall months. For more information on Birding is in the Birding section of our website. However species that can be seen include black tern, bald eagle and trumpeter swan. Other water birds of note include common loon, red-necked grebe, Wilson's phalarope, black-crowned night heron, osprey, and a large colony of great blue heron. 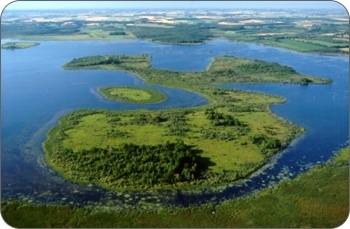 Several terrestrial species of conservation interest also nest at this site. The bogs in the Wylde Lake area support one of Ontario's southernmost breeding populations of Lincoln's sparrow. There are also breeding records for Le Conte's and Henslow's sparrow. Other notable species recorded at Luther Marsh include rare or unusual visitors such as snow goose, long-tailed duck, American white pelican, great egret, and ruddy duck. Please take the time to report any rare or unusual species to the GRCA so that we can keep our bird check list up-to-date. The diversity of habitat and the area's large size make this an important place for wildlife. It is home to 35 species of mammals, ten species of amphibians and 11 species of reptiles. Unusual sightings include the northern flying squirrel, Butler's garter snake and spotted turtle. The conservation area has four boat launches accessible after Sept. 1 when interior roads open to vehicles. The main launch is only suitable for canoes until that time.